In my attempt to speed up the approach of fall, I baked some Applesauce Spice Muffins today. 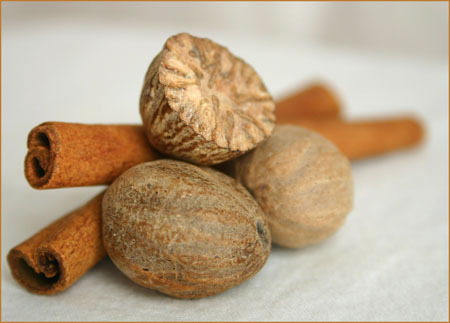 To me, nothing ushers in feelings of fall like the smell of nutmeg and cinnamon in the kitchen. October is when I normally break out the spice-scented candles and potpourri but I couldn’t resist spicing up the house a little early this year. I am just REALLY ready for this summer to be over! I am continuing my quest to create healthy but tasty muffin recipes and I think this one is another winner. 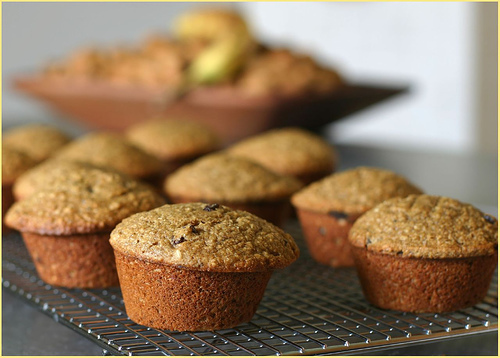 These whole grain muffins are substantial and filling, perfect for a quick breakfast on the run. The addition of oat bran and wheat germ adds not only complexity in flavor and texture but boosts the protein and fiber content. A bit of ground flaxseed contributes healthy Omega 3 fatty acids. But most importantly, these taste really good! 1. Before you begin, bring all ingredients to room temperature. Grease a standard sized 12-cup muffin tin. Preheatoven to 375 degrees. 2. Mix dry ingredients in a large bowl. Whisk them together well, breaking up any clumps of brown sugar with your fingers if necessary. 3. In a separate bowl, whisk together applesauce, buttermilk, egg whites and oil. 4. Pour wet ingredients into dry ingredients and stir together until just combined. Stir in raisins. 5. Immediately spoon batter into muffin tins then place in a preheated 375 degree oven. 6. Bake for 20-25 minutes. « Is Fall Here Yet? Thanks for such a great recipe! I've been looking for muffin recipes with flax seeds and this one sounds so healthy, plus, as you said it, it tastes good! I can't wait to try it! BTW, I found your blog by chance and like it very much. I've been thinking about starting a blog on gardening. Did it take you a lot of times to set yours up? I noticed the bottom of this page says "Design by www.vanillamist.com" . Is the design provided by WordPress or did you have to pay for it? Thanks for your reply. oh that recipe looks great! i guess i'm going to have to figure out how to grind up flax seeds now and might have to give in to buying a coffee/spice grinder! I am still in love with the fact that you include nutrition facts! And this does look like a great and healthy recipe. And while I love fall and I love the flavors of fall, it still feels a bit funny to be eating fall foods to me. Last week they brought pumpkin spice lattes back into Starbucks, and while I love them... I was shocked to see them already. Oh well... yay fall and yay your wonderful muffins! These look great! The apples on my trees are ripe and ready to be turned into applesauce to use in this recipe. Brilynn: Homemade applesauce is the way to go! I love it :-)Connie: Now that I've found the nutrition data calculator, I will try to provide the information on as many recipes as I can. But sometimes I don't want to know ;-)Alyssa and Jeannette: I sent your replies via e-mail, let me know if you have any more questions!Thanks everyone for stopping by and the nice comments! Ooh, I love muffins, spice, and heathy foods, so this one is quite tempting. I think I might hold onto the recipe and try veganizing it when I get the chance! I love fall, too. Apple season in Ohio is pretty darn good, and it brings locally pressed cider and apples for pies. Having something healthy like this will be a nice addition; I'll have to try it soon! Bloglily: Thanks :-)BitterSweet: Let me know how the vegan version turns out!mysisterskitchen: Thanks for the compliment and for stopping by!Curt: I want some cider! And some pie! If I had to write a description of fall, the words cinnamon and nutmeg would be in it. At a certain point in the year, pumpkin pie starts sounding great.I am trying a new sourdough starter made from organic grapes, if it works out I will send you the link. I recently found your blog and enjoying the many recipes that you've posted. Now, to make time to try some out ... like the chocolate zuchinni muffins, and these applesauce spice muffins. Any chance you can send them as e-mail attachments (LOL)? I love the aroma of Cinnamon and Nutmeg, very homely and comforting, not to mention delicious. Bring in apple, and baked together the combination must be mouth-watering, I can't wait to try this receipe. I can feel the Holiday Season already. Your site is great! I love baking with applesauce and I can't wait to try these muffins. Just made a batch of your gorgeous muffins and they are absolutely delicious! I'm so glad I came across your blog. Will be trying many more recipes for sure! This recipe is amazing! I stumbled upon your blog when I was looking for directions on making brown rice. I found your directions on making perfect brown rice- which really does result in perfect brown rice (thank you!). I made these muffins to bring in to work tomorrow. I tried one just to make sure they were suitable for sharing. Both my husband and I thought they were delicious!! I will definitely be keeping this recipe and making them often. I chose not to put raisins in them this time since some people don't care for raisins. But next time I'll be adding them since both the hubby and I like them. Thanks again! Wonderful recipe. I added whole eggs and macerated the raisins in apple juice so that they were moist & tender. I will probably add chopped walnuts next time too.